You’ve just moved in to your new home. You’re excited about finishing the basement, and adding more living space for your family. A new home theater. A games room. A bedroom. Are you also protecting it from flooding? In Colorado, most homes have basements. 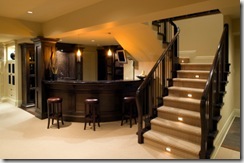 And a growing number of homeowners are also expanding their living area into the basement. But it can be frustrating completing your new addition, only to have it flooded a few short months later. Instead of waiting for the inevitable to happen, make plans to avoid it by installing a sump pump. A sump pump is usually installed where basement flooding is known to have occurred and is seen as a problem. But it can also be used to remove dampness that may occur because of ordinary and extraordinary events, such as large amounts of snow/rain fall. Sump pumps pump the water away from the home’s foundation, and send it to a place where it won’t pose a problem to the home itself, such as to a municipal storm drain or a dry well. Sump pumps are usually hardwired into a home’s electrical system, and may on occasion have a battery backup. In homes with finished basements, a homeowner may also decide to have a second sump pump as a backup. Since water may begin to overflow if not constantly pumped, a backup system should be considered for prolonged power outages. Once your sump pump system is installed, it is a good idea to schedule regular maintenance. A plumber can check its condition once per year to assure it’s functioning properly. A good cleaning will remove dirt, gravel, sand and other debris, increasing its efficiency and extending the life of the pump.